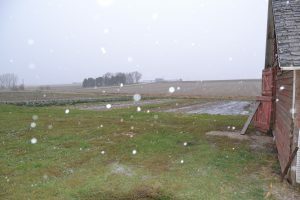 The snow flew at the last field day of the season, held November 8 at John and Janna Wesselius’ The Cornucopia near Sioux Center. John and Janna raise vegetables and poultry that they provide to 80 families through Community Supported Agriculture. They also sell at farmers markets and to chefs. The field day started on rented land new to John and Janna. Two seasons ago, they added six acres near Sioux Center’s water treatment plant. 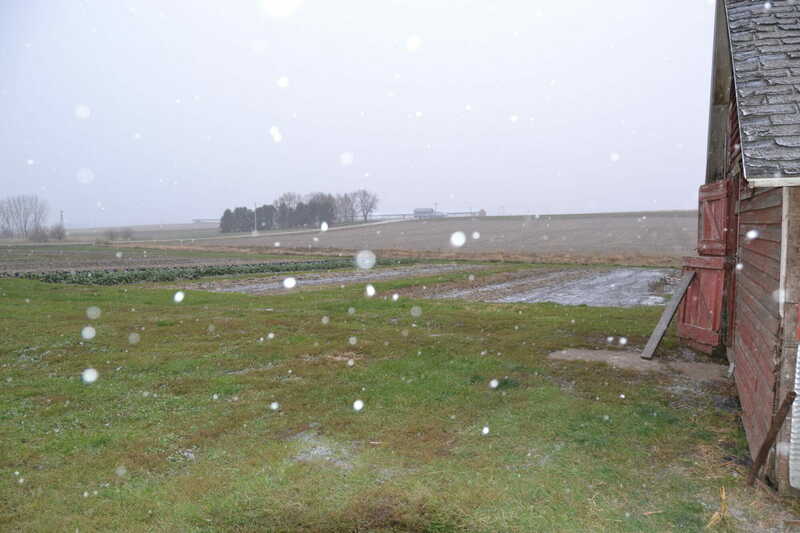 This land is 6 miles from their farm, and adds significantly to their production acres. Before acquiring this land, John and Janna raised vegetables on two acres at home, an acre adjacent to their newly acquired land, and on an acre-and-a-third on the west side of Sioux Center. This past season, John and Janna raised one acre of potatoes, plus carrots, leeks and brassicas on the new location. They had planted their 2019 garlic recently into this plot. They also planted an acre of strawberries in 2017, and another in 2018. 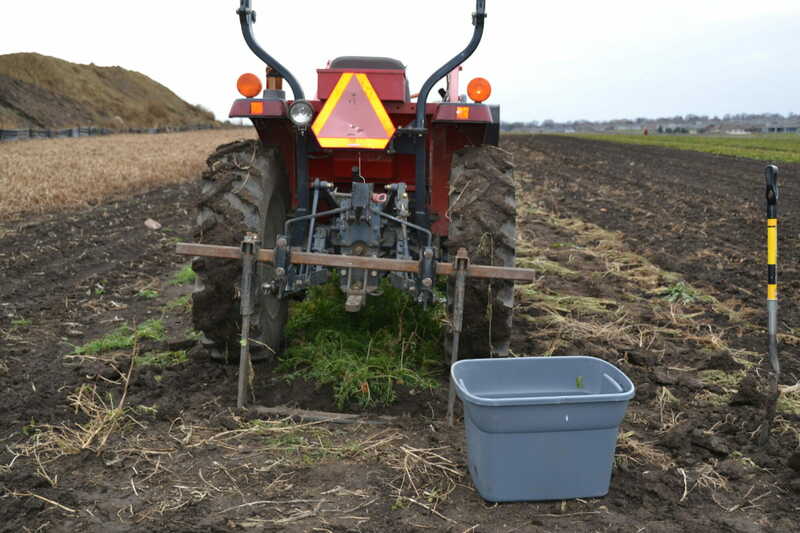 The first planting was quite weedy because of weedy straw and wrong equipment to cultivate. 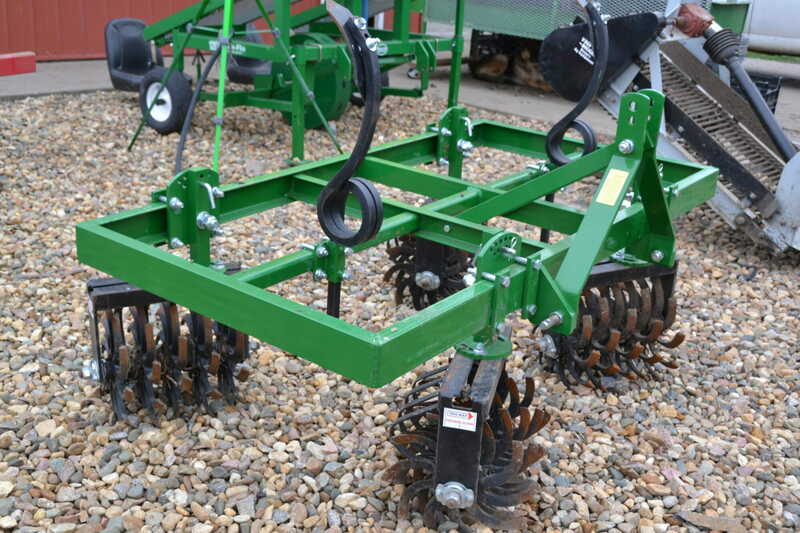 They have since acquired more appropriate equipment, and anticipate weeds to be more effectively managed in the future. 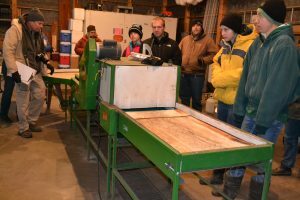 John and his crew demonstrated how they use a Wunderbar Undercutter from Woodward Crossings to harvest carrots. John and his crew stand on the back during harvest to provide weight for the cutter to go deep enough. 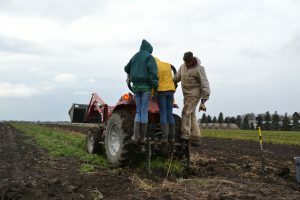 Before carrots are planted, the bed is rototilled and beds are marked with tractor tires. Janna does all the seeding on the farm. She seeds six rows of carrots per 32-inch bed, at one-and-a-half inch spacing. 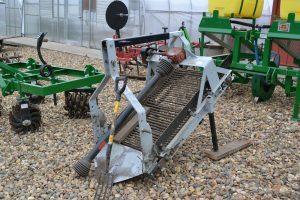 Janna said, “I use the Jang seeder for pelleted carrots, and the Earthway seeder for raw carrot seed.” Carrots are flame-weeded before emergence. They used to use a hand held flame weeder, but have upgraded to a flame weeder with five flamers on wheels for quicker work. 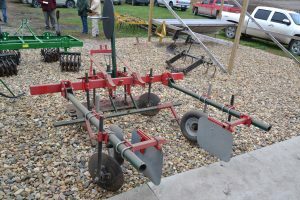 After emergence, a cobra hoe is the first tool for cultivation. “The cobra hoe is my favorite long-handled hoe,” said John. 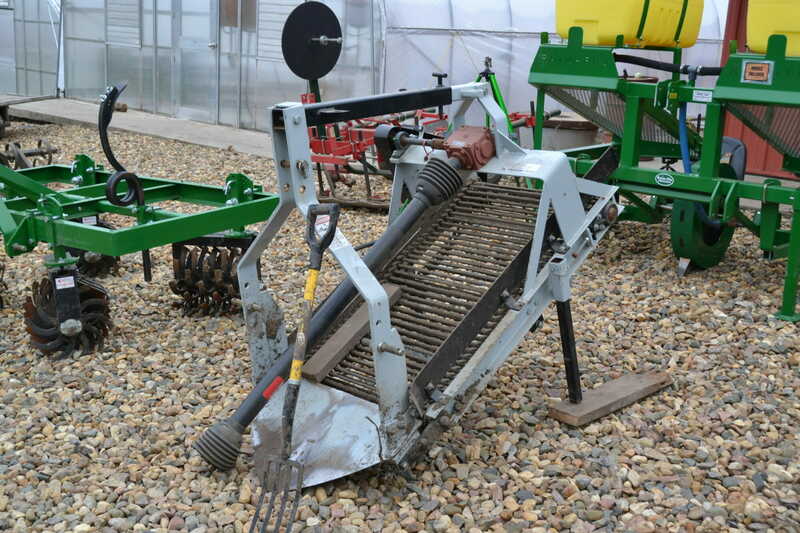 They use the cobra hoe between rows when vegetables are still seedlings. 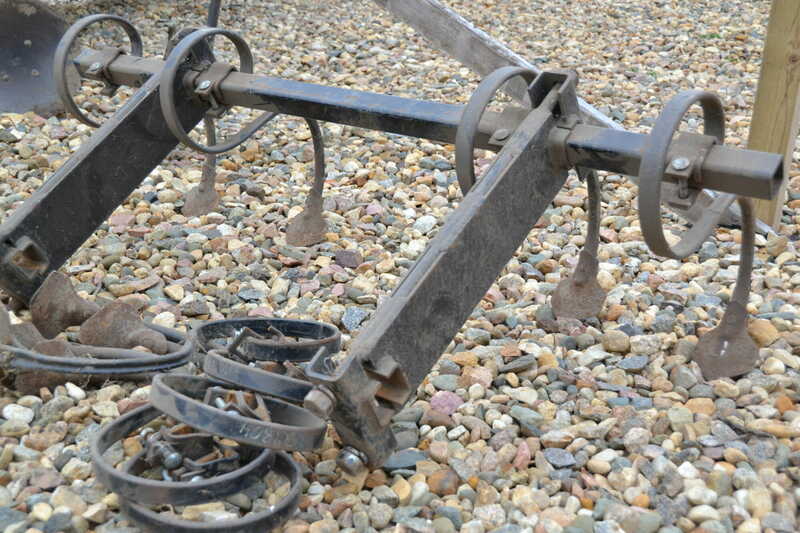 Another favored hoe is the wheel hoe. They typically harvest five pounds of carrots per bed foot, or 2,000 pounds per 400-foot row. 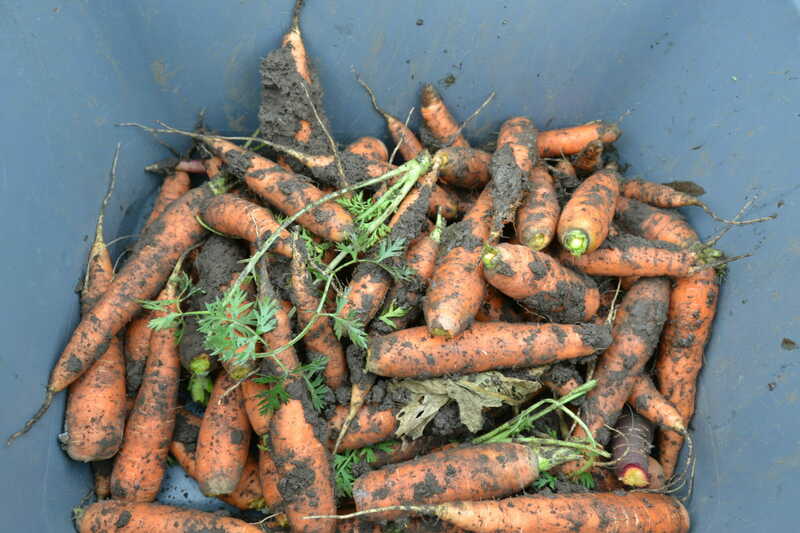 At 25 beds per acre, their extrapolated calculation is a harvest of up to 50,000 pounds of carrots per acre. Favored varieties are mokum for sweetness, and bolero for storage. 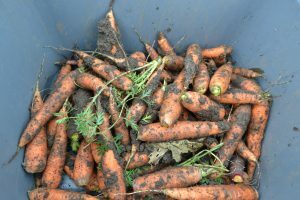 Last year, however, was not a prime carrot year because of the cold, wet spring. 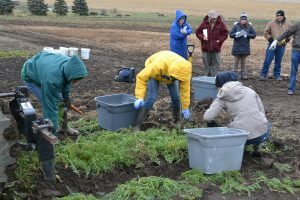 Because they weren’t able to plant carrots per their usual schedule, they lost out on eight weeks of market sales, where they sell 300 to 500 pounds per market. John and Janna used to create potato trenches with a furrower. Then, they went to a middle buster. 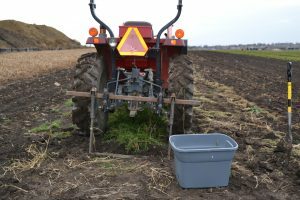 Potatoes were planted by hand. Now, they plant potatoes with their waterwheel transplanter, and are able to plant 1,000 pounds at 12-inch spacing in two-and-a-half hours. Often they green-sprout the potatoes, by spreading them out in a dark area that is about 45 to 55 degrees for four to seven days before planting so the eyes sprout. “You don’t want them too long,” said John. He likes to get his potatoes planted before April 15. 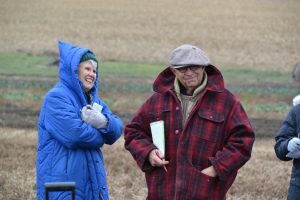 John and Janna hoped to demonstrate a potato harvest as well, but due to the frigid fall, had to harvest their potatoes prior to the field day. 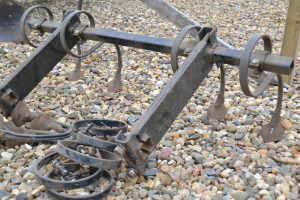 It would have been quite the demo, as John said they can lift a 400-foot row of potatoes in five minutes with their potato digger. They then pick them up by hand, which can take a crew of three or four an hour, depending on yield. When asked how to control Colorado potato beetle, John said, “The best control is long and far rotations.” If he does have pressure, he will intervene with biological insecticide DiPel. If there is still significant pressure 10 days later, he will use a spray from Monterey Gardens that contains spinosad, a natural substance made by a soil bacterium that can be toxic to insects. Any time he needs to spray, John adds one ounce per gallon fish fertilizer to his backpack sprayer. 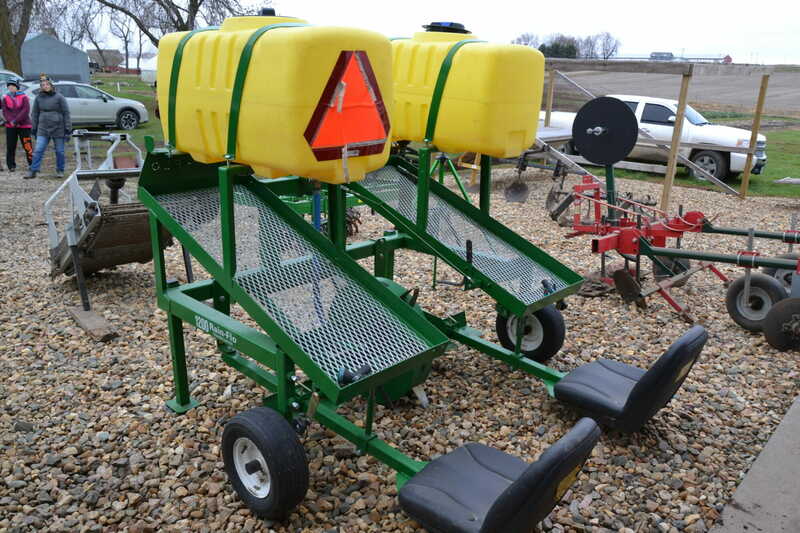 “Kansas State University has a great sweet potato breeding program. That is where we source our sweet potatoes,” said John. They lay black mulch out four weeks before transplanting, and then put a slip every 18 inches in two rows per bed. 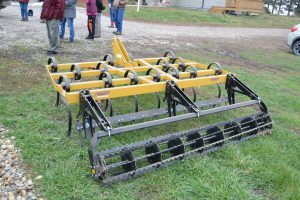 Next year, they will either plant sweet potatoes closer, or just plant one row per bed, to harvest with the potato digger more efficiently. They dig and sell fresh sweet potatoes. They also cure sweet potatoes in black crates with heater on at 55 degrees under a tarp in the greenhouse for a week. “These will last until our spring CSA,” said John. 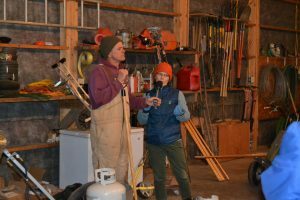 John and Janna talked about equipment they used to rely on, equipment they recently purchased and added to their toolbox, and equipment still on their wish list. John and Janna own one tractor, a 40 horsepower four wheel drive Massey Ferguson. This tractor is used for all farm operations. 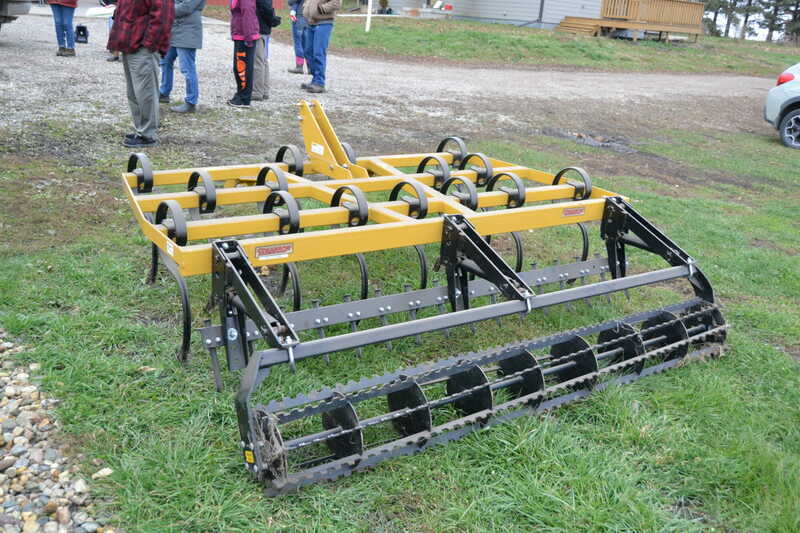 John used to cultivate with a Woodward Crossings ‘S’ tine cultivator. Now they use a Hillside cultivator. 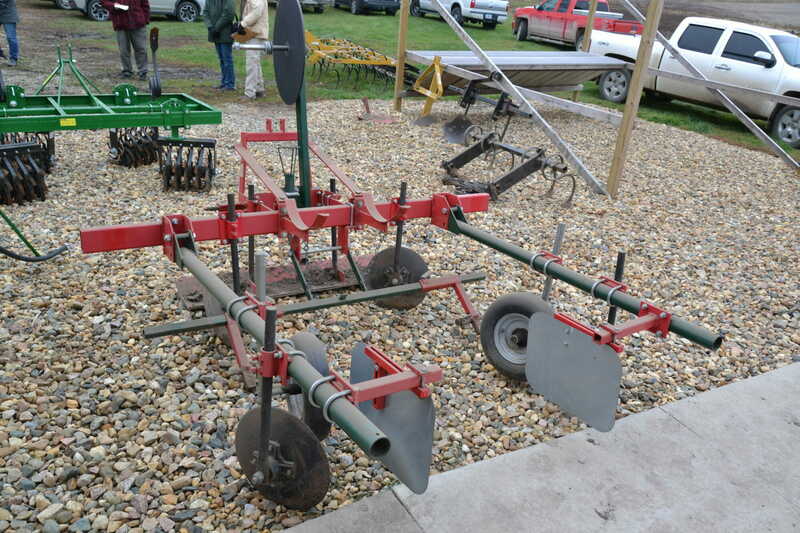 They purchased this cultivator for strawberries but have found it works very well to cultivate other crops, too. When asked about reusing drip tape, John responded, “We don’t reuse drip tape. Recycled drip tape creates a nightmare the next season. John and Janna had attempted to use a root cellar in their home for storage, but the location proved too far for efficiency. Next year, they want to eliminate the basement root cellar, and triple their walk-in cooler space. 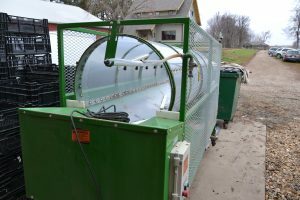 They plan to partition the cooler, so one area can be kept at 33 degrees, and the other at 40 degrees, to provide ideal storage environments for a multitude of crops. 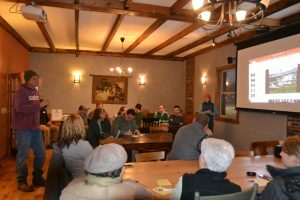 After braving the cold field and workshop, field day attendees finished up with a warm meal at the Fruited Plain Café, a restaurant that regularly purchases John and Janna’s produce. We enjoyed soups and sandwiches made with food raised at the Cornucopia. We all learned about John’s enthusiasm for potatoes while in the field, and photos of red thumb fingerlings and a field of flowering potatoes reinforced his potato passion. He said, “I really love potatoes. Flowering potatoes are a beautiful sight for a guy who loves potatoes.” As an eater who got to enjoy John and Janna’s potatoes that night, I concur!